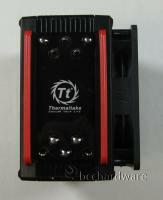 Today we've got the latest and greatest from Thermaltake on the test bench, the new Frio CPU cooler. 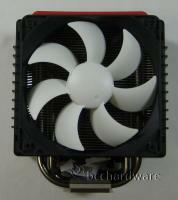 This cooler is a big one and can handle CPU's up to 220 Watts which should give you more than enough cooling ability to cool any CPU out there with room to spare. 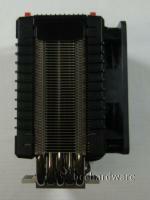 The Frio has been designed with overclocking in mind and even supports the new Intel and AMD 6-core processors. 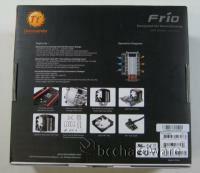 The design of the Frio is similar to some of their other models (like the ISGC-300 which we reviewed here) and utilizes the popular "tower-heatpipe" design. The Frio is designed to run with either 1 or 2 120mm fans installed (the Frio comes with 2 fans) and with both fans installed you should be able to get some decent airflow happening if you don't mind the noise (both fans are adjustable from 1200 to 2500 RPM). Let's take a closer look to see what the Frio is all about. 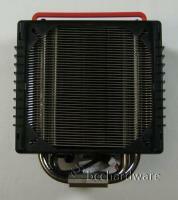 As you can see in the pictures the Frio isn't too crazy of a design and is pretty similar to other "tower-heatpipe" coolers that are by far the most popular design in the past couple of years. 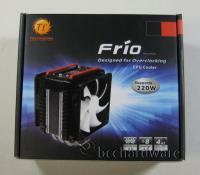 The Frio is a bit bigger than some of the other coolers of similar design that we've tested and the inclusion of 5 heatpipes should help improve the performance of this cooler. The Frio comes with 2 fans, both of which are capable for running anywhere between 1200 and 2500 RPM thanks to the built in fan adjustment dial on each fan. As you can see in the pictures below (right) the accessories that come with the Frio are pretty standard and come with everything you need to install this cooler on a wide range of AMD and Intel CPUs (including all the new 6 core processors). 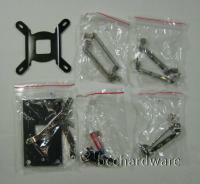 Everything in the accessories is nicely labeled according to what CPU socket you are installing the cooler onto and if you follow the instructions installation should be a breeze. So there we go, that's what the Frio is all about, let's move onto the next section for the in depth details.